Researchers from Malaysia’s Universiti Teknologi MARA’s Faculty of Engineering are investigating the possible use of sludge from sewage wastewater as a material to create concrete. To see if the idea was viable, the team set out to produce domestic waste sludge powder (DWSP) by burning sun-dried sludge cake in a ferro-cement furnace over 72 hours to remove as much moisture as possible. They then ground and sieved the cake to make the sludge powder. 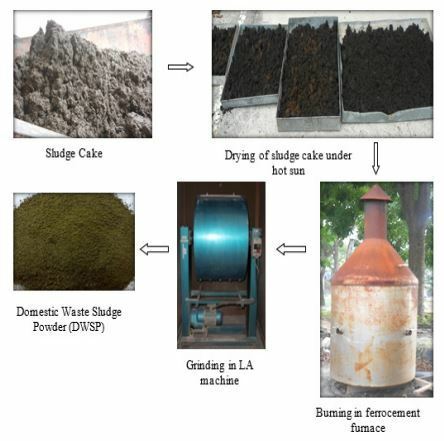 Process involved in the production of Domestic Waste Sludge Powder (DWSP). Image courtesy Faculty of Civil Engineering, Universiti Teknologi MARA, Shah Alam, Selangor, Malaysia. Different proportions of DWSP (three, five, seven, 10 and 15 percent) were mixed with Grades 30, 40 and 50 cement to produce a range of concrete samples. These were then compared with normal samples of concrete in compressive strength, water absorption, permeability and rapid chloride ion penetration. Results showed DWSP concrete had lower compressive strength, and higher water absorption and permeability with greater concentrations of DWSP. Grade 40 concrete with seven percent DWSP was the exception , displaying greater compressive strength and lower water absorption and permeability, creating a more durable concrete. Resistance to chloride permeability increased for concretes with 15 percent DWSP. “Overall, there is potential for using DWSP as a partial cement replacement. However, more detailed research should be conducted to yield methods for producing quality powder,” the researchers concluded in their study. From a civil engineering perspective this idea might stink at first, but Malaysia’s construction sector has recently been looking for economic and ecological replacement materials for cement. The sludge powder may not completely replace cement, but does offer an opportunity to use a little less. The solution also “kills two birds with one stone.” The country’s wastewater plants are experiencing a growing issue with disposing the sludge produced from sewage water treatment. Studies indicate that the volume of sludge is expected to rise and disposal options are limited due to environmental regulations, which include a ban on burying sludge in soil due to its high heavy metal content. So why not put it to a more practical use? The study was published in the Pertanika Journal of Science and Technology. Esse post foi publicado em Artigos Diversos, Artigos Tecnicos, Mundo e marcado Construção Civil, Domestic Waste Sludge Powder (DWSP), Malaysia's Universiti Teknologi, MARA's, Pesquisas sobre Contreto, Researches about Concrete from Sewage Sludge Mixture, Tecnologia na Construção. Guardar link permanente.